The young and beautiful music fans of Williamsburg will soon be replaced with gallons upon gallons of overly-chlorinated water. Gowanus Lounge published an extensive first-hand account of the CB-1 meeting that took place Tuesday night, where the Parks Department and its architecture firm showed off their latest plans for Williamsburg's beloved McCarren Pool. The pool, which hosted weekly concerts with popular musical acts over the past few summers, still has it's $50 million dollar funding secured and is on track to open in two years. While the diving pool aspect may take longer to finish, architects announced plans for a volleyball court to hold it's place, which will basically be a deep pool full of sand, hiding the pipes. In the winter, the pool will be available for use as an ice rink, which Gowanus Lounge's tipster notes "would be done with an outside vendor like Bryant Park." Since closing, music fans around north Brooklyn have been looking for its replacement. 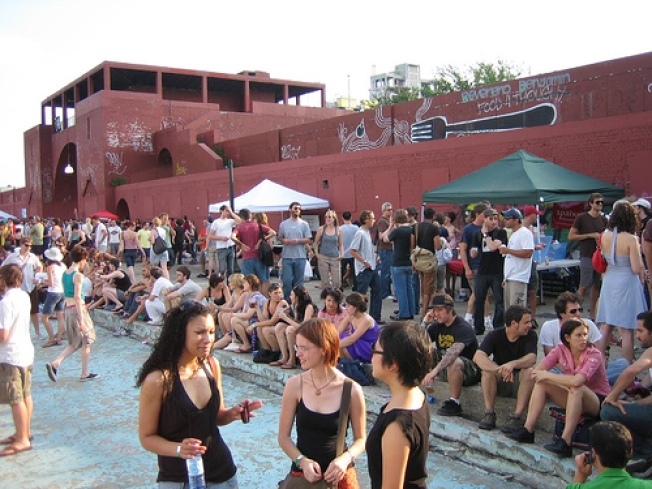 Back in August, the Daily News reported that JellyNYC, the company responsible for the summertime pool parties, its working with the Parks Department to secure one of two potential sites, either "East River State Park in Williamsburg [or] the forthcoming Bushwick Inlet Park on the Williamsburg-Greenpoint waterfront." Above photo taken by Flickr user Vobios.